How Are Roller Shutters Made? Security window grilles can be installed on almost any type of window in most homes and business premises. Burglary is unfortunately an all too frequent occurrence in Australia, with upwards of over 330,000 taking place each year. Of these, it is reported that some 39% occur through a forced window. However, custom-made security window grilles are a cost-effective and efficient solution and are especially useful if you’re not able to install an expensive alarm system. 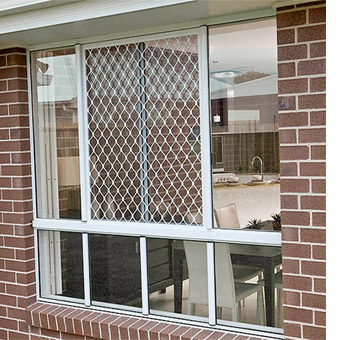 Australian Standard AS5039 establishes clear and well-defined standards to ensure that security window screens manufactured and installed in Australia are robust enough for Australian conditions and provide sufficient levels of home security. At Direct Shutters, all of our window grilles adhere to this standard. Our security window screens are made from high-grade extruded aluminium, which means they are both strong and corrosion resistant, and so you can expect many years of service without the need to replace them or to undertake maintenance. They are also be able to withstand a variety of impacts, ranging from a human being attempting to crash through the screen, to protection from objects such as rocks or bottles being thrown at the window. In addition, they are able to withstand concerted attempts to jemmy or pull the screen off, which means that your windows will have extremely high resistance to forced entry and vandalism. Furthermore, the high-grade aluminium mesh is strong enough to resist cutting, or attempts to shear through it with a knife or other blade. An added bonus is that they are also strong enough to prevent a determined pet from chewing through them. Custom-made window screens from Direct Shutters are designed to fit your existing windows, so there is no need to make any structural alterations to your home. They can also be made in a wide variety of colours, which means that they will fit in with and enhance your design concept. We also ensure that your window grilles are properly designed and installed so that they fit your windows in such a way that there is no rattling or shaking in high winds. We offer a variety of designs and mesh types, which means that you can still have clear, unobstructed views from your windows, while at the same time being able to control the degree to which people from outside can see into your home. They also provide a visual deterrent to would-be intruders. Copyright © Direct Shutters 2015. All Rights Reserved. Media Gain website design Adelaide.